From his apartment building across Ninth Street, Ed Powers can see the first blooms of a new Russell. The sight isn’t much to look at yet — just a dirt-covered lot surrounded by a tall wire fence. But come fall 2020, a fresh senior housing complex should rise from the property, signifying new life in a neighborhood that’s long needed it. The complex is part of a multi-phase project that will replace an aged public housing development with 640 mixed-income units. The Beecher Terrace development was built in 1939 and sits on more than 30 acres just west of downtown Louisville. It long has been home to a predominantly African-American population who has suffered from institutionally racist policies such as redlining and urban renewal, Mayor Greg Fischer said. In late 2016, Louisville received a $29.6 million Choice Neighborhoods grant from the U.S. Department of Housing and Urban Development to start revamping the distressed development. And last week, local officials and community members watched as construction workers broke ground on the first phase. “I think it’s so amazing to sit here and look back at the city, at downtown Louisville, from this spot,” U.S. Rep. John Yarmuth said at an on-site press conference. “When we started pounding on the HUD secretary several years ago to include us in this incredible Choice Neighborhoods program, we kept stressing that this was the roadblock to (tying) the west part of Louisville to the rest of the city. 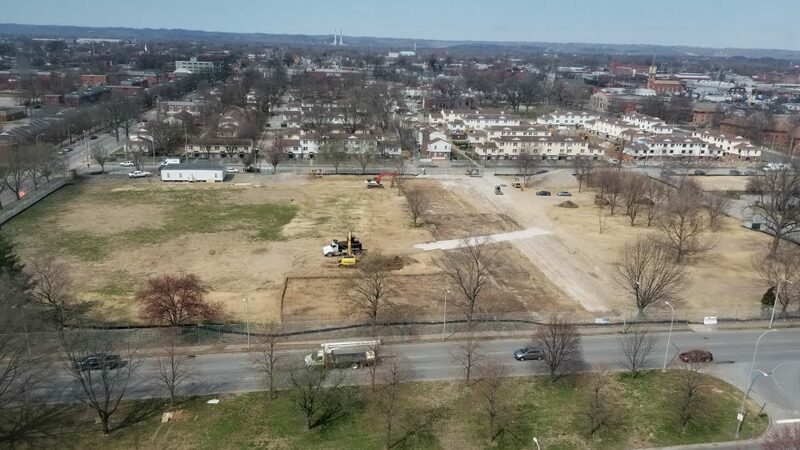 The redevelopment of the Beecher Terrace property will be a years-long process carried out in at least four phases, said Laura Kinsell-Baer, a project manager with St. Louis developer McCormack Baron Salazar. The first phase, to be completed by fall 2020, will include constructing 117 apartments for people 55 and older. It will be built with about $6.2 million from the Choice Neighborhoods grant, along with more than $35 million in leveraged funding from public and private sources. Almost $13 million of that additional funding will come from the Louisville Metro Housing Authority, the agency behind the Choice Neighborhoods grant application. In total, the new housing complex will feature 620 rental properties and 20 homes for ownership. More than 450 units will be offered at affordable prices to lower-income families, while 186 units will be set at market rates. In 2015, when Louisville applied for the Choice Neighborhoods grant, some 1,300 people were living at Beecher Terrace, where the median household income was around $5,880. Many of those residents have since moved with assistance from the Metro Housing Authority and Urban Strategies, a nonprofit that’s worked with Beecher Terrace residents to find replacement housing during the property’s transition. Former residents who want to move back to the new complex will get a lifetime preference, Mayor Fischer said. The housing authority and Urban Strategies have also offered Beecher Terrance residents support with job placement, transportation assistance and homeownership counseling, Fischer said. Powers has lived in the Russell neighborhood for almost 70 years and said he looks forward to the day he can apply for an apartment in the new complex. “When I came up, it was a city within a city,” Powers said of the Russell neighborhood. “I mean it was like … all of the ideals that we were taught we actually got to live.